Declared a World Heritage Site by UNESCO in 2005, the church of the Güell Colony is one of Antoni Gaudí's key works. Colonia Güell was a textile colony where the architect Gaudí planned to build a large church, though in the end, due to financial problems, only the crypt and entrance portico were finished, between the years 1908 and 1914. 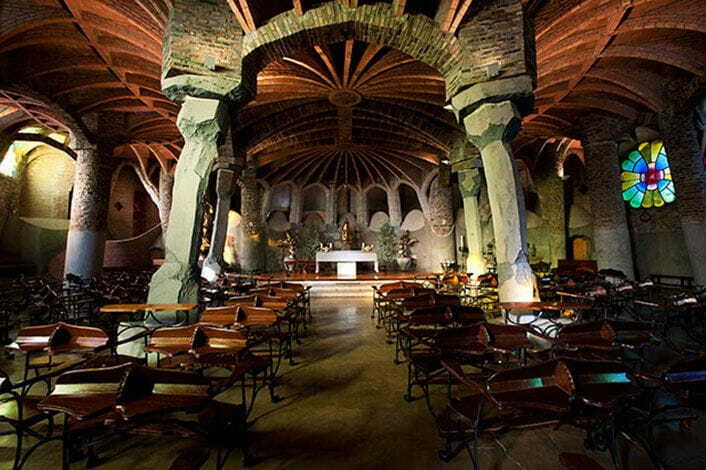 Nonetheless, it is still considered one of Gaudí's most important works given its complexity: the crypt is adapted to the hill’s slope through the main altar, has five naves (one central and two on each side) and was built with basalt stones, giving it an ancient look. Inside are four irregular columns that surround the altar, situated in the center. The stained glass has an abstract cross-shaped design and blends almost imperceptibly with the iron that frames the windows, irregular as well. At the entrance, a composition made of ceramics represents the four cardinal virtues. This combination earthy colours, multiplicity of forms inspired by nature and integrated with the exterior landscape, dialogue with space and nature, and strong symbolism make crypt something of a magic cave, both natural and artificial, where Gaudí tried many of the ideas he would later incorporate in the Sagrada Familia. Colonia Güell, designated Property of Cultural Interest, is an example of 19th century innovations in one of the largest industrial complexes in Catalonia where people worked, lived and attended school .At Colonia Güell, one can visit the church-crypt, 'Gaudí’s most hidden treasure', where the brilliant architect experimented for the first time with many of the architectonic solutions he would later use. In 2005, the crypt was designated a World Heritage Site by UNESCO.